Below is our store policies and procedures. If you need futher assistance, we can be reached thru our 'Contact Us' page. Our Store shall automatically charge and withhold the applicable sales tax for orders to be delivered to addresses within the state of NJ. For orders shipped to other states, you are solely responsible for all sales taxes or other taxes. Items are shipped from multiple warehouses, please allow one to two weeks for all items to be received from possible multiple shipments. If you receive a damaged, incorrect or are missing items after all the shipments have arrived , 'Contact Us' or send an email within 48 hours from the day of receipt . Keep all items, boxes, and packing material shipped to you for inspection. You will need to provide us a description of the damage to the item as well as the condition of any packaging. This is necessary to determine if there was hidden damage from the manufacture, Shipper damage, or inadequate packaging. If the item was damaged or defective you should hold on to the item for 7 business days to make possible Shipper pickup. For missing items, please make sure you have removed all packing material from the shipping box to confirm that the item was not hidden from view. Sometimes small items are placed inside other items to protect them during shipping. If your order required multiple boxes to ship, it may be helpful to check the tracking information to confirm that all packages have been delivered. The missing item tracking procedure typically takes 7-14 business days to complete and consists of an inventory level verification, package weight verification, and carrier investigation. You may or may not be contacted by the Shipping carrier during this time. All returns must be received within 30 days after you receive your order. All returned items must be unused and in the original packaging, so as to be able to be placed back on our shelf. If you wish to return an item, please 'Contact Us' to obtain a Return Authorization Sheet that must be placed inside the returned products box. Please also "Contact Us" by email with the shipping tracking number after you have shipped so we can be looking for the returned and credit your account. Credits will be made upon receiving and examining returned items. Unauthorized returns or items returned used, damaged, or not in their original condition and packaging may result in a delayed refund, partial refund, in-store credit, or refusal of the returned items. If the item is returnable a maximum of 20% restocking fee will be incurred. We can ship to any street in the Continental United States only (sorry no P.O.Boxes). Upon entering your ZIP code in the Shopping Cart, a Shipper like FedEx calculates their own rates in real time, based on the actual weight and dimensions of the items you ordered from our warehouses in the Midwest to your zip code. We accept the following credit cards: Visa, MasterCard, Discover and American Express. There is no surcharge for using your credit card to make purchases. Please be sure to provide your exact billing address and telephone number (i.e. the address and phone number your credit card bank has on file for you). Incorrect information will cause a delay in processing your order. If you use Paypal please verify your "Ship To" address they have on record is current and correct. Customers can also send a Money Order to our address in "About Us" with a print out of the items desired and then "Contact Us" by email that the order has been mailed. Backyard Wild Birds has always been committed to maintaining the accuracy, confidentiality, and security of your personal and corporate information. We have established Privacy Principles to govern our use of customer information. 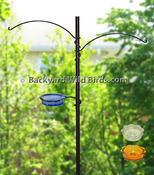 Backyard Wild Birds does not sell, share or distribute Customer Information to any third party organization. You understand and agree that the owners of this site shall not be liable for any direct, indirect, incidental, consequential or exemplary damages, including but not limited to, damages for loss of profits, data or other intangible losses ( even if the owners of this site have been advised of the possibility of such damages), resulting from the use or the inability to use the product(s) and or service(s) or any misuse of the product(s) and or service(s) in a manner not in accordance with their intended use.